Monte Bay is in a sweet exclusive quiet location, one with a picturesque waterfront setting and excellent privacy. You will love the sound of the surf being at the waters edge. To be fair to all sizes of parties, we offer discounted rates for small groups by adding an additional guest fee to larger groups. Monte Bay is tucked into a tropical lush enclave with the main house built just above the turquoise and azure waters of Monte Bay, and the guesthouse built just behind the main house. Both houses face south–southwest and are a sun lover’s dream with soft breezes and warm sunshine all day long. Monte is hidden from view from the private road that accesses Klein Bay, and there are no traffic noises or intrusions. A short walk takes you to a pebble beach for swimming and snorkeling and a 10-minute swim/snorkel brings you to the white sand beach at Ditliff Point. Both Ditliff Beach and Klein Bay are protected by Ditliff Peninsula, so the calm, crystal clear waters are sheltered from heavy surf and strong winds which makes this inviting for swimming, snorkeling, and kayaking. Monte Bay is a 7 to 10 minute drive from the groceries, restaurants and shops of Cruz Bay. Monte Bay is a handsome 2-½ level, custom home that was designed to be a luxurious indoor/outdoor tropical villa. To enter Monte you descend through a hillside garden and enter the great room with the kitchen on your right, the formal dining room on your left and the interior living room just 3 steps below the kitchen/dining areas. The two upper-level guest bedrooms and a convenient half bath are also located just below the kitchen. The spacious gallery (covered porch) contains a second living and dining area which is cooled by tropical breezes. The gallery is a half level below the interior living/dining area. From the gallery, tiled stairs on the left lead to the lower level with the master bedroom and the lower left guest bedroom, plus a 30' ceramic tiled pool surrounded by a tiled deck. The right set of stairs from the gallery leads to the lower right guest bedroom and a secluded hot tub nestled into a romantic setting. The gallery, pool and sun deck are the outdoor part of the home. The gallery serves as a lovely outdoor living and dining room. When you relax here the sound of gentle surf and views of turquoise seas surround you. The indoor parts of the house are the kitchen and all the bedrooms (2 inside access, 3 outside access) plus the enclosed living and dining areas. 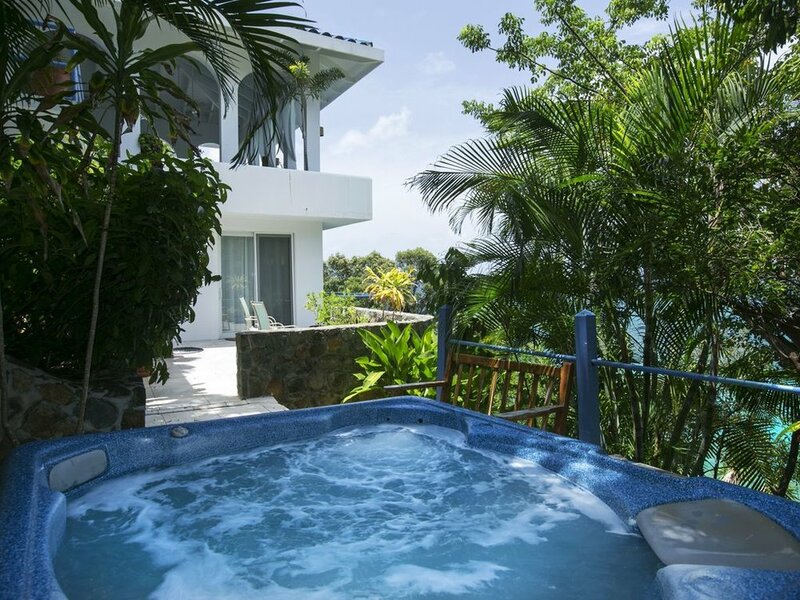 Banana, papaya, palm and other abundant vegetation surrounds the house and create a superb clothing optional privacy. The bedrooms are located on two levels. On the upper level two guest bedrooms (queen beds) are located on opposite sides of the great room to insure maximum privacy. Both of these bedrooms have air conditioning, 4-poster mahogany beds, tiled floors, vaulted ceilings and screened sliding glass doors that open to balconies with picturesque views. They also have tiled baths and private outdoor stone garden showers that are surrounded by luxuriant tropical foliage. The spacious, air-conditioned master bedroom (king bed) is located on the lower level. 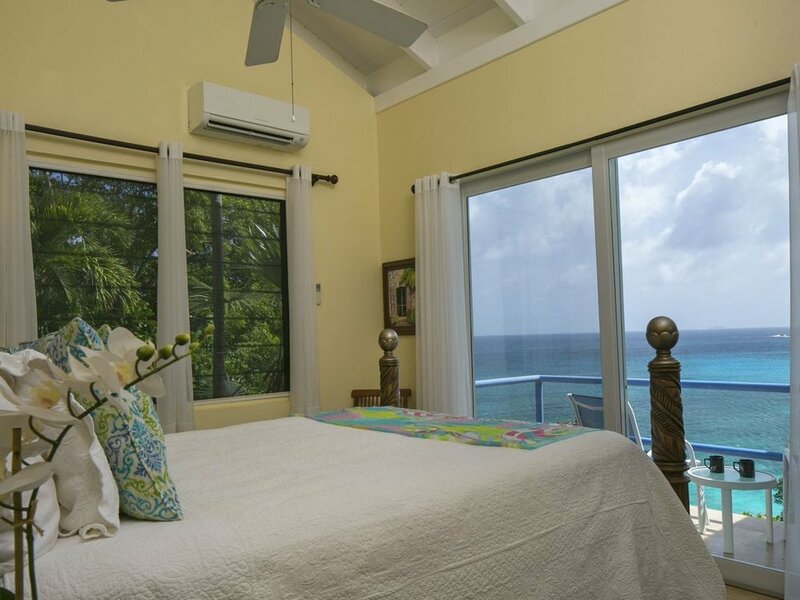 It features lovely views of the Caribbean through 20' screened sliding glass doors, and also includes a large bath/dressing room that is entered through beautiful stone arches. The fourth a/c bedroom (king bed) and bath adjoins the pool deck on the lower left, while the fifth bedroom (twin beds) is on the lower right side of the villa near the hot tub. The kitchen has been completely remodeled and looks gorgeous with cherry cabinets accented by granite countertops and top name stainless steel appliances. It includes a 5-burner gas cook top stove, standard and convection ovens, a refrigerator/freezer, a microwave oven and dishwasher and a granite countertop bar with bar stools. The kitchen is amply supplied with cooking supplies, utensils and dinnerware. A laundry room with a washer and dryer is located off the great room and a separate stone patio off the deck contains a BBQ grill. The interior dining room is centered around an expanded table that seats 12, while casual lunches and dinner may be served on the pool deck or in the gallery. The stylish, interior great room is furnished with top of the line furniture, and includes a cable TV/DVD and a stereo with CD and cassette. The gallery is the outstanding design feature of Monte Bay. It is surrounded on 3 sides by Mediterranean style, 12 foot, open arched windows that effectively capture all the beauty of the Caribbean. The gallery is tastefully furnished in custom made cushioned furniture and is an absolutely splendid place to read, relax, paint or unwind. The Guest House at Monte Bay is an attractive villa built of stone and concrete and is located above and behind the main house. Like the main house, the Guesthouse enjoys a very private, quiet and romantic location. A spiral staircase leads from the ground level to the upper level, which contains the kitchen/living and dining areas, as well as the master bedroom and master bath. 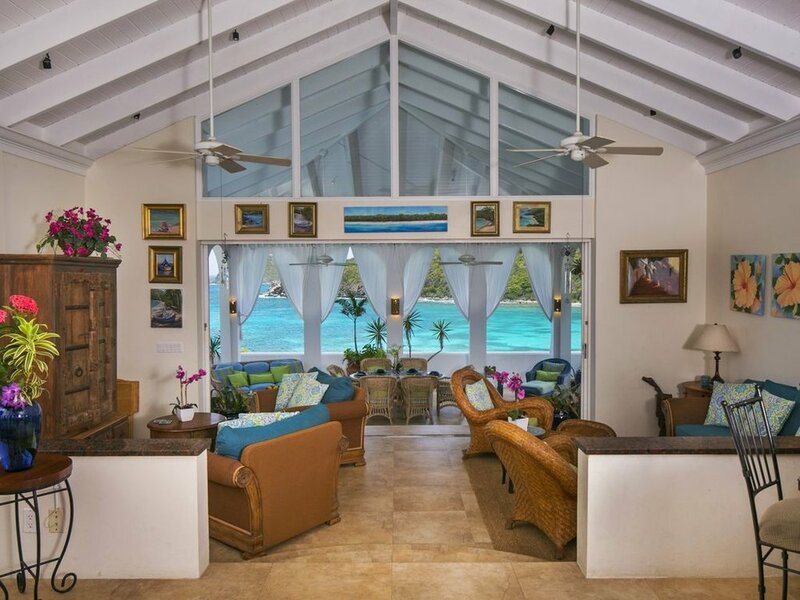 An exterior covered deck runs the full length of the upper level of the Guesthouse, and from the deck there are scenic views of Rendezvous Bay and the Caribbean. 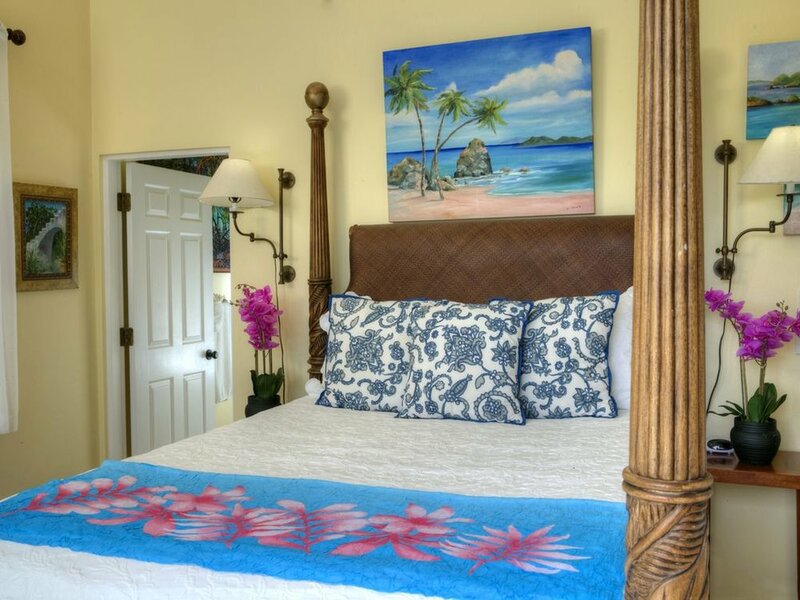 The Guesthouse has stonewalls, beamed cathedral ceilings, tiled floors throughout, and tropical furnishings and artwork which creates a classy, comfy and inviting living environment. The a/c master bedroom (queen bed) has stonewalls and a delightfully romantic essence with screened sliding doors that open to water views. The kitchen is modern and completely equipped, with tiled countertops, a 4-burner gas stove and oven, dishwasher, coffee maker, toaster oven and a small table for two. Sliding doors open from the living area to the decks and views of the water. A tile and stone master bath with lots of closet space and a stone shower is off the master bedroom. A second bedroom (queen) and private bath is located on the ground level. You also have private access to the path that leads to snorkeling and swimming, in the beautiful waters just below the house.